Summer is upon us and we feel the easinesss that the warm weather and outdoors bring. The kids are almost out of school and barbeques are beckoning us. Take advantage of the laid back time to get some projects out of the way. Own a beach house or boat? Spruce up your summer "spot" with new outdoor cushions, new upholstery, furniture or summery accessories. We appreciate your readership! Did you know that you need seven sources of light to properly illuminate a space. You're probably thinking, "Seven?? I think I have one lonely lamp in the corner on that end table." More often than not, we walk into rooms and decorating projects where there is a lot of discussion about color and furniture and window treatments. This is all great! However, the one area that gets overlooked the most is lighting (besides accessorizing, but that's for another article). The Hunter Douglas "Summer Window Fashions Sale" is HOT! 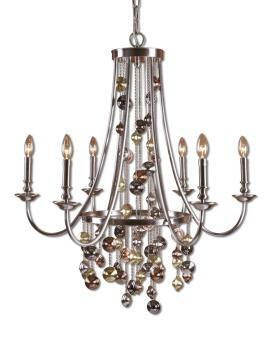 Uttermost is a great lighting, accessories and accent furniture company. They offer wall art, end tables, clocks and out-of-the-ordinary lamps, sconces and chandeliers. Browse their site for affordable, beautiful pieces that will set your home apart with added style. We offer discounts on most items and can special order any piece for you! 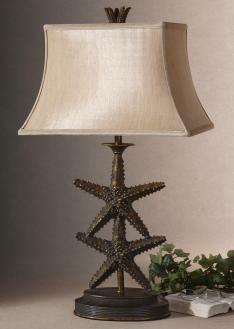 See their website at www.uttermost.com. With any valance or drapery order, receive 25% off the lining portion of your order! Whether it's cotten sateen or blackout lining, we'll take 25% off! Just mention this coupon to take advantage of this great special!